​​NEW YORK, New York - The recruiting class of 2016 has been receiving high praise for some time now. Many experts have called it one of the most talented, deepest collections of talent that we have seen in twenty years. From dominant big men, to floor general point guards. From sharp shooters, to elite wings. The hype is certainly deserving with this class. With that being said, certain players, because of both talent level and situational circumstances, are going to have more positive impacts than others next season. I like to call these young men, Game Changers! Maybe you've read an article or nine on ESPN proclaiming that Duke will be the preseason #1 team in the country in 2016-2017. While I am not yet ready to crown the Blue Devils, I am cognizant of the fact that Coach K and staff are bringing in a tremendous recruiting class, spearheaded by 6'9" SF Jayson Tatum and 6'9" PF Harry Giles. Both of these dynamic talents will be at the forefront of any national title run that Duke will attempt to make. With Tatum, the Blue Devils get a smooth wing presence that can handle and distribute the basketball, defend, attack the basket, and stroke it from the outside. Look for him to nicely fill the void left behind by Brandon Ingram's early entry into the 2016 NBA Draft. With Giles, Duke gets a much needed interior presence to go alongside returning senior Amile Jefferson. But Harry Giles is so much more than just a post player. At 6'9" and 230 lbs, Giles can take his man off of the dribble as quickly as a guard, and possesses both the strength and athleticism to finish in a variety of ways. He has excellent footwork and timing on defense, which makes him an outstanding shot blocker from the help side. My only concern with Giles is that he is coming off of his 2nd serious knee injury. His key attributes are his explosiveness and his strength, so hopefully neither will be diminished. All signs point to him being back to 100% by the time Fall practice starts. I cannot move along without mentioning SG Frank Jackson. Had he gone to any other school in the country next season, he'd be the key recruit. But he chose Duke with Tatum and Giles ranked ahead of him, so he gets a bit overshadowed. That's unfortunate, because at 6'4" and 195 lbs, the sweet stroking wing from Alpine, Utah is a player. The McDonald's All American Game co-MVP will be a vital - vital - piece to everything that Duke does next season. With the departure of PG Derryck Thornton, look for returning junior Grayson Allen to get a lot of minutes at the point, which opens up the starting shooting guard position for a competition between Jackson, Matt Jones and Luke Kennard. Damn, Duke is loaded next season. The ultimate Game Changer next season will be Kansas' Josh Jackson. Prior to his commitment to the Jayhawks just a few short weeks ago, Kansas was facing a situation where it might have been without that ever so important athletic wing player on its roster. With Wayne Selden and Brannen Greene leaving early for the NBA Draft, Coach Bill Self may have had to get creative with his lineups next season, had Jackson decided to go elsewhere. Besides Selden and Greene, KU also lost seniors Perry Ellis, Jamari Traylor and Hunter Mickelson, as well as freshman Cheick Diallo. But all of that worry subsided when one of the top high school talents in the land tweeted out that pic of him wearing the Jayhawk blue. With Jackson, Coach Bill Self gets - maybe - his best wing prospect ever. Yeah, I said it. Jackson is not only a tremendous scorer and rebounder, but he can fill it up from the outside, defend four positions, and creates for his teammates like a 6'7" point guard. He plays with a cockiness usually reserved for those special, special talents. There is nothing that Josh Jackson doesn't think that he can accomplish on a basketball court. And for the most part, he's right. His athleticism is through the roof, as is his basketball IQ. His presence alone on the floor demands attention from opposing defenses, which only helps him create for his teammates. That kind of attribute will mix well with a veteran backcourt like Frank Mason, III and Devonte' Graham. 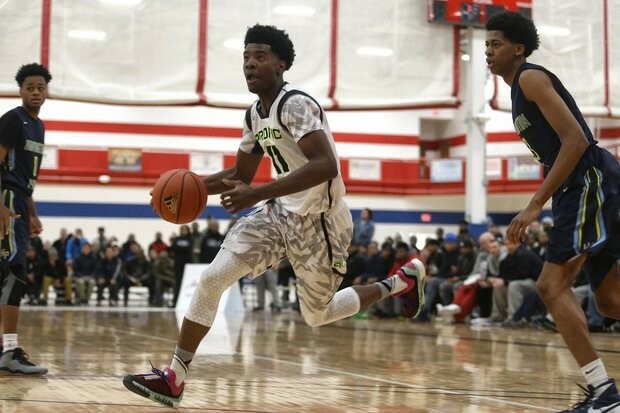 Getting a commitment from Josh Jackson moved Kansas from a Top 25 team in 2016-2017, to a national title contender. It's as easy as that. There is no disputing the fact that the game of basketball has transcended over the years into a point guard's game. Just like the quarterback in football, the point guard controls the flow of the game, establishes the tone, and sets the table for his teammates. Without a heady and strong PG, you're not going very far in the NCAA's. Just look at a few of the last national champions: Ryan Arcidiacono, Tyus Jones, Shabazz Napier, Peyton Siva, Kemba Walker, to name a few. The next name you need to know, is Lonzo Ball. 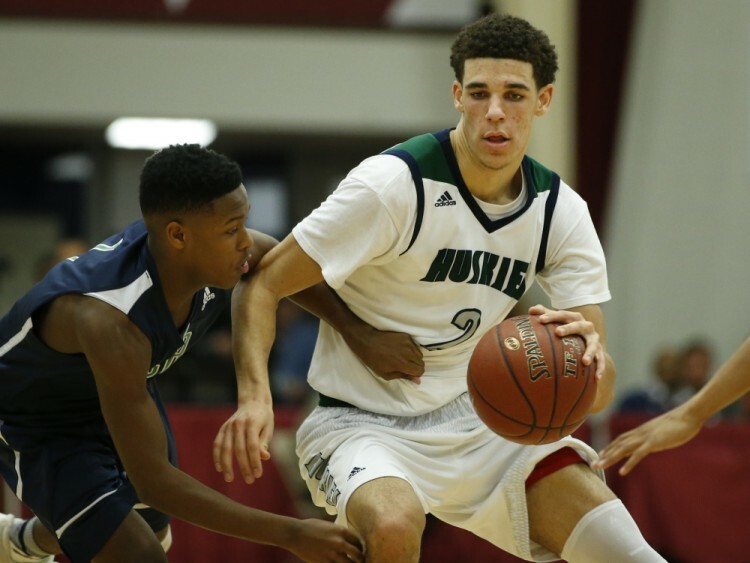 The 6'5" lead guard out of Chino Hills, CA is the best point guard in the Class of 2016, which is saying quite a bit considering the number of five star PG's heading to campuses next season. Ball, who is headed to UCLA, is a "4 D" man, meaning he can drive, dish, dunk, and drain. Head Coach Steve Alford, who also has five star PF T.J. Leaf heading to Westwood, has some lofty expectations of what the Bruins can accomplish in the Pac-12 next season, and that is because of his incoming freshman point guard. A big, athletic player, Ball has the ability to just take over any game in which he is playing on both ends of the floor. In fact, Lonzo Ball may have led the nation last season in blocked shots by a PG. Offensively, he can attack the basket with a viscous attitude, drop a smooth dime, or pull it from deep. The three point line is only a suggestion for Ball, who is in range as soon as the bus doors open. If there is one player that is a must see next season, it is Lonzo Ball. Kentucky Head Coach John Calipari is no stranger to amazing recruiting classes. 2016 is no different as the Wildcats have signed up six total recruits, including four blue-chippers. The key to the class, however, and upon whose shoulders the season will turn, is the 6'9", 240 lb PF known as "Bam." Edrice "Bam" Adebayo, that is. An incredible man-child of an athlete, Adebayo is a warrior on the interior, owning the glass at times and flushing everything in site. He is built like Dwight Howard, but with feet and hands like Kevin Garnett. Another top prospect with unbelievable athleticism, Adebayo will garner much attention inside next season in the SEC, which will present opportunities for the rest of the Wildcats on the perimeter. If Kentucky is to get back to the Final Four in 2017, Bam Adebayo will lead the way. Speaking of tremendous point guards, Arizona Coach Sean Miller has another coming his way in Kobi Simmons. The slender 6'6" playmaker out of Alpharetta, GA is the real deal. Simmons is a triple threat from the perimeter who can attack the basketball, create for his teammates, or pull up from anywhere. His size makes him a tough matchup as he's generally taller than opposing PG's, and too quick for any other position to handle. With cat-like instincts defensively and an ability to get to the glass, Kobe Simmons is that kind of player that can control the entire floor. Simmons will thrive next season in Tuscon, playing alongside fellow freshman wings Rawle Alkins and Terrance Ferguson. If Arizona can establish anything resembling any interior presence, the Wildcats will be a tough out come March, and that will be because of Kobi Simmons. One incoming freshman who has not received the type of attention that he is deserving of is Tony Bradley, who is heading to North Carolina in the Fall. At 6'10" and 235 lbs, Bradley may be the premier post player in the Class of 2016. He possesses incredible feet and hands for a player his size, with a nose for the ball and an outstanding ability to pass out of the post. He is a fundamentally sound interior big man, but he can also put it on the floor from 17 feet away and blow by his defender. With the losses inside that UNC will likely see due to graduation and the NBA Draft, Bradley could step right in alongside Isaiah Hicks and form quite the formidable interior duo in the ACC next season. Tony Bradley is a Game Changer for the Heels because he is the type of player that can transform and complete a team on both ends. It may take a couple of months, but when it comes time for the ACC schedule to begin, you can bet that Bradley will be a main cog in Coach Roy Williams' wheel. Full disclosure, I love Kyle Guy's game. Heading to Virginia next season, Coach Tony Bennett sure has a good one on the way. At 6'2" he is a little undersized for your typical shooting guard, but Guy is an unbelievable talent and competitor who does it all on the court. He possesses an outstanding handle and athleticism, which allows him to go right past anyone that attempts to defend him straight up. He also may be the best shooter in the class, so you can't give him any room. That combination makes him an almost impossible player to guard. He also loves to create off of the dribble, and has tremendous bounce. Kyle Guy is a special, special talent that is sure to rip up the ACC for years to come. I can see him moving right into the Cavaliers' lineup in the spot left vacant by ACC Player of the Year Malcolm Brogdon. If Virginia is to again challenge for the ACC in 2016-2017, it will be because Kyle Guy made sure that the Hoos never skipped a beat. We will finish this up with a Game Changer that not many are talking about ... yet. UConn Head Coach Kevin Ollie has one of the most dynamic PG's in the country heading to Storrs next season, and he has the ability to single handedly bring the Huskies back to the national spotlight. Alterique Gilbert, out of Lithonia, GA, will most likely be handed the ball as soon as he steps on campus. A quick, athletic 6'0" lead guard, Gilbert reminds me a little of Allen Iverson with his ability to blow by anyone, get to the bucket, and finish strong. He can also fill it up from the outside with the best of them, or drive and dish it off. He is lightning quick on defense, and rebounds like a player six inches taller than he actually is. With the incredible amount of talent in this class, it is easy to get a little lost in the rankings. But make no mistake, when discussing the top PG's in the country next season, the name Alterique Gilbert should be mentioned.